How To Extend Life Of The Highway Guardrail Drilling Machine? Guardrail Drilling Machine has become one of the indispensable equipment highway, since it is highway, highway guardrail drilling machine will be overburdened, the use of drilling machine will be after a long overworked, becomes more and more easy to be damaged, so the drilling machine maintenance has become an essential topic, how to better maintain the guardrail drilling machine? From which aspects should the life of a drilling machine be prolonged? 2. Reduce various corrosive effects. 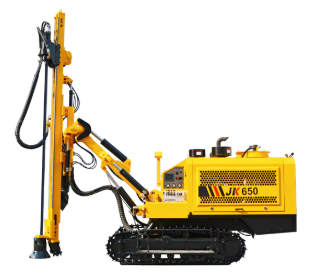 Crawler Mounted Pneumatic Drill Rig supplier tells you that guardrail pile driver metal surface and surrounding medium attack chemical or electrochemical action and damage phenomenon called corrosion. This corrosion will not only affect the normal operation of mechanical surface equipment, but also will corrode the parts inside the machinery. As a result of this corrosive effect is sometimes invisible, touch, a brief by negligence, the greater the harm. The handling and operating personnel should adopt useful methods according to the local weather conditions and air pollution conditions at that time. The chemical corrosion has an impact on the machinery to prevent rain air from entering the machinery and reduce the operation in the rain as much as possible. 3. Reduce the influence of mechanical impurities. Mechanical impurities generally refers to dust, soil and other non-metallic materials and guardrail pile driver in the use of the process of their own attack of some metal chips, wear products. There are impurities inside the machine, reaching the collaboration surface of the machine, its harm is very big, not only make the relative movement out of retardation, accelerate the wear of parts, and will scratch the collaboration surface, damage the lubricating film, make the parts temperature add, lubricating oil transformation. 4. Reduce the influence of temperature. Guardrail pile driver in the operation, the temperature of each part is not the same. Such as the general cooling water temperature is 80-90 ℃, the temperature of hydraulic oil in 30 to 60 ℃, below or above this size will speed up the process of wear parts, lead to disintegration of lubricating oil, constitute a material function change and so on. Highway guardrail drilling machine to extend the service life of the method is these four, want to know more about the drilling machine consulting, quickly pay attention to jinke technology website. Next: What are the reasons that affect the drilling speed of highway drillers?